Unless you’re marinating or brining your wild salmon fillets (see below), you will want to season them right before you’re planning to cook them. That’s because salt will pull out water from the salmon, robbing the lean fillets of their moisture. That doesn’t mean you should hold back on the salt, as it’s not going to pull moisture from a cooked fillet; just don’t let the salt sit on the raw salmon. Using an instant read meat thermometer is the most accurate way to assess the doneness of your fish. For wild salmon, aim for an internal temperature of 120 °F at the thickest part of the fillet. You can use a thermometer to check the temperature of your wild salmon no matter the method of cooking, but you’ll want to check the temperature sooner rather than later if you’re cooking with high heat; broiling, grilling, or searing gives you a smaller window of time to pull your salmon from the heat at the perfect moment. If you’re baking or pan-frying wild salmon fillets, having a “barrier” can help the salmon cook through more evenly, rather than leaving you with overcooked outsides and undercooked insides. For baking, you can top your salmon with olive oil and a “blanket” of accoutrements like parsley, shallots, and lemon slices to protect it from drying heat. Also, make sure to keep the salmon skin on; it’s a built-in barrier that contains the highest concentration of omega-3 fats in wild salmon. In a hot pan or on a grill, you can also use a barrier to prevent overcooking. Make a platform out of components like onion rounds that are just beginning to caramelize, roasted potatoes, or fresh stems from whatever herbs you’re using (you can save the leaves for a vinaigrette/sauce to form at the end). Keep in mind that pan-frying or grilling this way will not allow you to get a crispy crust on the fillet, as it needs to be in direct contact with hot oil to get a proper sear. For a perfectly cooked fillet with a golden sear, check out our favorite way to cook wild salmon. Brining wild salmon can help the fillets retain their moisture if you intend to cook them with high temperatures and dry heat. Fish brines are not different than brines that you would use for pork or poultry: they consist of ice cold water (for food safety purposes), salt, sugar, and an acid like vinegar or citrus juice. Most fish brine recipes call for approximately an 8:1 ratio of water to salt, with a bit of sugar and acid to balance out the flavor of the solution. (Note that brines are much saltier for smoked or cured fish recipes.) Feel free to add in other ingredients that will infuse depth of flavor into the brine. Garlic, ginger, fresh chili, black peppercorns, citrus zest, and fresh herbs all make wonderful additions. Once you’ve assembled your brine, pour it into zip top bag or any non-aluminum vessel that will allow your brine to fully submerge your fillets of wild salmon. Store in the refrigerator overnight or for at least four hours. You can begin to brine your salmon even if they are still frozen solid; they simply will need to be brined a bit longer than overnight in order for the brine to work its magic. Pat fillets very dry before introducing to heat. Discard used brine. Poaching is a gentle method of cooking fish that will help your wild salmon retain maximum moisture. If you’re not keen on medium-rare fillets and prefer your salmon to be cooked through, poaching is going to be your best bet as it is the least drying method of cooking. 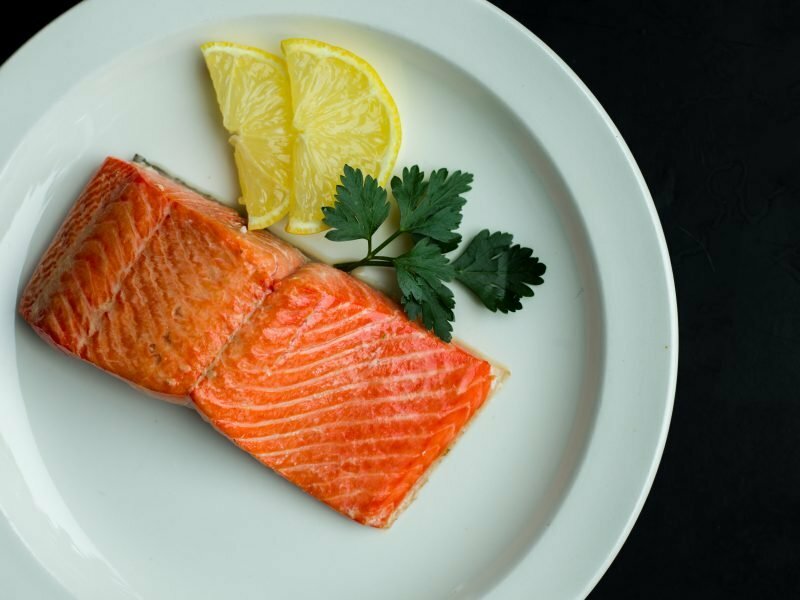 Using stock, wine, milk, tea, or just plain water as a poaching liquid, your fillets of salmon will cook gradually in a simmering bath until it flakes easily or until it reaches an internal temperature of at least 120 °F. Check out our guide on how to poach wild salmon for more information. If you’ve got an Instant Pot, you’re set up to cook moist and tender fillets of salmon in a matter of minutes — even if the fillets are still frozen! Check out this recipe for a classic, salt-and-pepper seasoned wild salmon dinner.